The prospects for Millennials are “discouraging,” the researchers said. A new analysis of Millennials’ current and future financial health by the Center for Retirement Research, which sponsors this blog, finds similar results about their retirement, concluding that they are “less well prepared” than older Americans. To compare each generation’s financial outcomes, the Urban Institute Researchers plugged the myriad factors that determine personal wealth into their model – from marriage and homeownership rates to home equity levels. The analysis hinged on making a lot of difficult assumptions accurately. One advantage Millennials have is higher rates of college graduation. 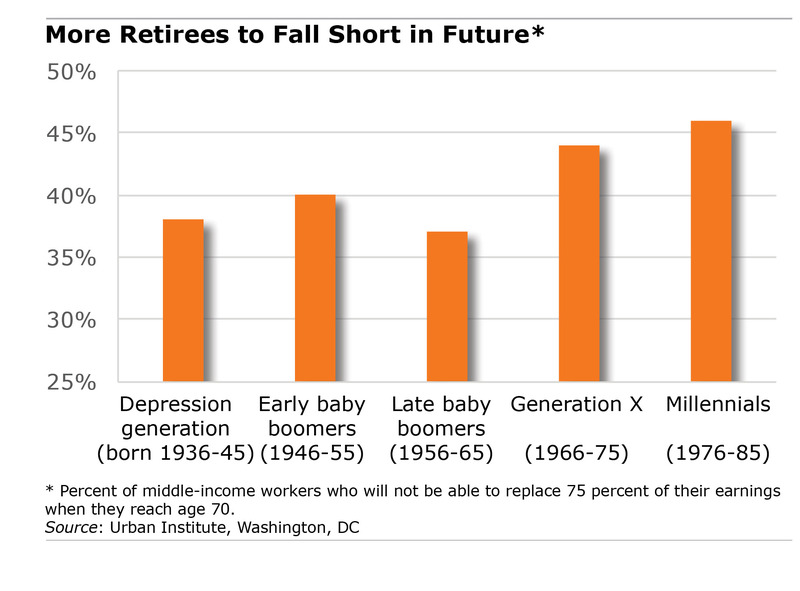 This could improve their future labor market prospects and make it increasingly easy to save for retirement. But here’s another concern: the researchers presented the case for the “typical” Millennial. Unfortunately, less-educated, low-income, single or minority Millennials are likely to do even worse. While 75% income replacement may be an appropriate goal for those with average incomes, I think it is way too high for those making twice the average income, or more. My wife and I are making just over half our pre-retiremnt income and seem to be able to afford what we want (including lots of foreign travel). I suspect the same is true for most people who made two or three times the average income before retirement. Agree with William but that’s not the whole story. How you live, your life style, saving habits, how you handle what you have – makes the difference. Had zero when married at 27. Was a ditch digger on a concrete crew. Lived frugally. Invested. Now 74 & millionaire, actually multi-millionaire. So if having stuff now is what they want, they won’t have it later. Pretty basic unless misfortune or fortune happen. Requires thinking ahead and having self-control.